The commander of U.S. Strategic Command (Stratcom) on Tuesday said he’s reviewing a landmark arms treaty in light of Russia’s violations of the deal. Separately, Russia is on track to comply with the New START Treaty, and the military is not reviewing that agreement despite President Trump's criticisms of it, Stratcom commander Gen. John Hyten told the Senate Armed Services Committee. Allegations from the United States that British spy agency GCHQ snooped on Donald Trump during his election campaign are "arrant nonsense", the deputy head of the U.S. National Security Agency (NSA) said in an interview on Saturday. President Trump has stood by unproven claims that the Obama administration tapped his phones during the 2016 White House race. On Thursday his spokesman cited a media report that Britain's GCHQ was behind the surveillance. Richard Ledgett, deputy director of the NSA, told BBC News the idea that Britain had a hand in spying on Trump was "just crazy". DNA is nature's hard drive, capable of storing, replicating and transmitting massive amounts of information. Researchers in New York found a way to use DNA like an actual computer hard drive, successfully storing, replicating and retrieving several digital files. A pair of scientists from Columbia University and the New York Genome Center selected five files -- including a computer operating system and computer virus -- and compressed them into a master file. They transcribed the master file into short strings of binary code, combinations of ones and zeros. 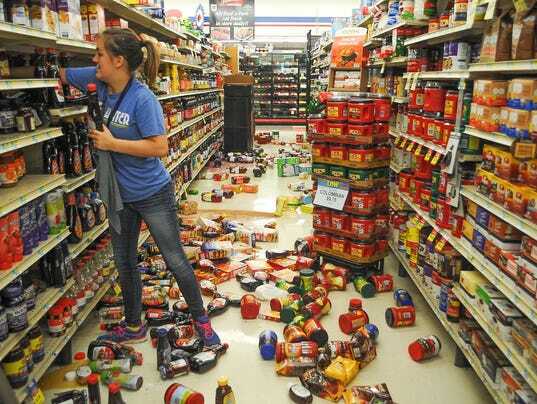 Three million Americans, primarily in Oklahoma and Kansas, are at risk from human-induced earthquakes this year, the U.S. Geological Survey said Wednesday. That's the conclusion of a new report that cites wastewater disposal from fracking as triggering the quakes. The number of Americans affected this year is less than last year, when the agency reported 7 million were at risk. A powerful bomb blast on Monday ripped through a protest in the Pakistani city of Lahore, killing at least 11 people and wounding dozens, according to officials. The explosion went off in Lahore's busy Mall Road during a rally attended by hundreds of pharmacists protesting against a new government law outside the provincial assembly building. Jamaat-ur-Ahrar, a Pakistani Taliban-linked armed group, claimed responsibility for the attack, which also wounded at least 30 people, including media personnel covering the protest. John Hurt, the intense British actor who mesmerized audiences in starring roles in “The Elephant Man” and “1984,” and was the Alien’s very first victim, has died. He was 77. Hurt, who announced he was diagnosed with pancreatic cancer in 2015, died in London on Friday, his spokesman told The Associated Press. Hurt was a man of many personas on screen and stage. But he was unrecognizable in his most memorable role as the star of 1980’s “The Elephant Man,” in which he portrayed with great dignity and pain the real-life John Merrick, who suffered from a disfiguring, debilitating disease.